Here is the list of best free Scrabble Dictionary for Windows. These Scrabble word finder let you find all the possible matches of words for a string of letters that you have entered. With the help of these Scrabble helper software, you will not find difficulty in solving any Scrabble word game. Just type a string of alphabets and get the maximum combination of words for it. You can also apply filters to your search in order to get more refined results. Some of these Scrabble solver also display total number of words found. Some of these Word Finder Scrabble freeware also display meaning of words found. Not only meaning, but also other information, such as synonyms, anagrams, and a link to its Wikipedia page. Hence, these software not only improve your Scrabble skills, but also improve your vocabulary. One of these Scrabble word finders lets you edit and add words to its dictionary. Besides this, you can add more information to any word, like synonyms, antonyms, etc. 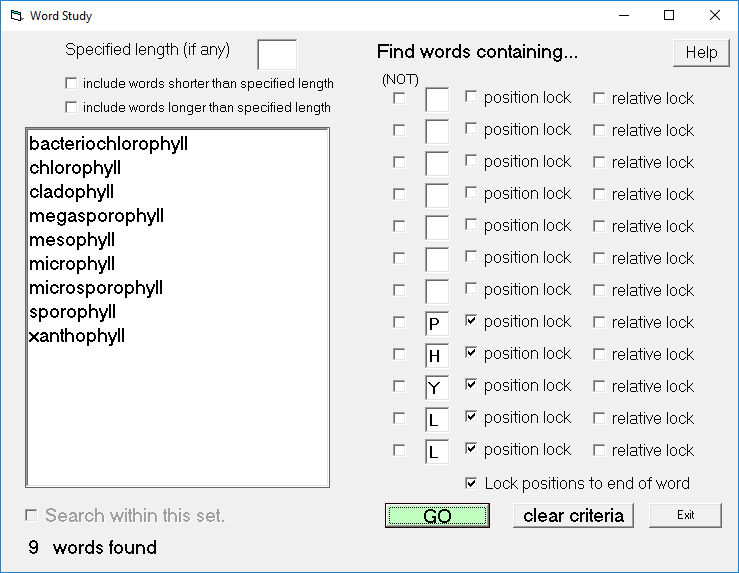 Shift Word Helper: This words finder software shows additional information along with the possible word combinations, like minimum Scrabble points for every word, length of all words, and meaningless or unused words. It also lets you apply filters to your search, like words beginning or ending with a particular letter. This is the only software in this list that comes with dictionary mode. Moreover, it is available in two languages: English and French. 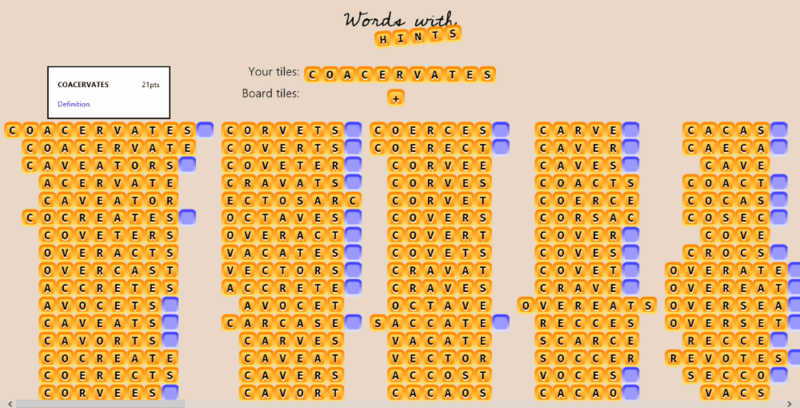 Words With Hints: This is a very simple Scrabble word finder app in this list. It offers very simple user interface. Just enter an alphabetical string of any length and press enter. As simple as that. In addition to that, you can also apply filters to your searches, like you can use a question mark as a blank space within the letters to get more word combinations. Go through the list and give a try to these free Scrabble words finder software. You may also like some best free Board Games and Maze Games for Windows. Literakta is a free Scrabble dictionary software for Windows, which lets you find all possible words from a string of letters. It is a very simple to use software and offers hassle-free interface. To find all possible words, what you have to do is just type a string in search tab of the software and press enter. This free Scrabble word finder will show all possible words that can be formed from the entered letters and also displays the total number of words found. Dot (. ): Use it to add blank spaces in between two letters. Special Character (^): It eliminates all preceding letters of a particular letter before which it is placed. Special Character ($): It eliminates all succeeding letters of a particular letter before which it is placed. This is a great Scrabble helper that helps you improve your vocabulary and makes you a good Scrabble player. Shift Word Helper is another free Scrabble dictionary software for Windows. This free Scrabble word finder helps you find all possible words that can be formed from a string of letters defined by you. Like Literakta, it also lets you apply filters to your search in order to get more relevant results. This software comes with various search options, which include Dictionary mode, Specify First Letter, Specify Last Letter, and Use Regular Expressions. Just type any string of letters and press enter. It shows you all the possible valid word combinations. It is mandatory that string of letters must contain special character (*) at least once, otherwise, you will not get any output. Dictionary mode: Enable this mode if you want to get an output in the sequence defined by you. For example: if you want a letter at a particular place, say at third place, then use this mode. It also shows you minimum Scrabble points for each word along with their length. You can also modify results by changing the length of letters. This length can be varied from 2 to 10. Just double click any word and it will show you its meaning and other information. This is an advanced feature of this words finder freeware. Shift Word Helper comes in two languages: English and French. Download a very simple Scrabble word finder software, Words With Hints. Thanks to its simple user interface, anyone can easily understand and use this software. Using this Windows 10 app, you can easily find out the maximum possible word combinations formed from a string of letters typed by you. Use a Question mark symbol (?) for one blank space. For example: If I type b?t, it displays all possible words by filling up that blank space with appropriate letters (like, but, bit, bat). You can also apply a filter to the results by clicking on Board Tiles. I entered a string of letters containing 21 letters and this word finder from letters app showed me all the possible words formed from that string of letters. This is a very good feature of this word finder app. I don’t know exactly what is the limit of letters that you can type in this app for finding out possible words. Click on any of the formed words and the app shows you Scrabble points for that word. Besides this, you can also view the meaning of a word. 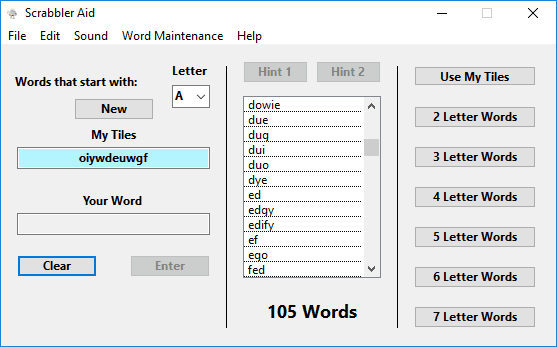 Letters Make Words is another Scrabble dictionary for Windows. This Windows 10 app lets you find words from a string of letters defined by you. Just enter the string of letters and get all possible words of any length. It has more than two hundred thousand words, more than 20000 Thesaurus entries, and more than one hundred thousand meanings in its Scrabble dictionary. Anagram: An anagram is a word or phrase formed by rearranging letters of another word. For example: word cat can be rearranged as act. In this mode, enter any string of letters and its length. The app will show you all possible Anagrams. Polyword: This mode lets you enter a string containing letters of any length and shows all possible word combinations. I don’t know exactly what is the limit for a string to be entered. I have entered 19 characters long string and it showed me all possible words. Presets: Presets are the predefined filters in which you have to just enter word length and it shows you possible results. It contains two types of filters, namely, Words containing Q but without following a U and Words containing one of the letters J, Q, X, or Z at least twice. 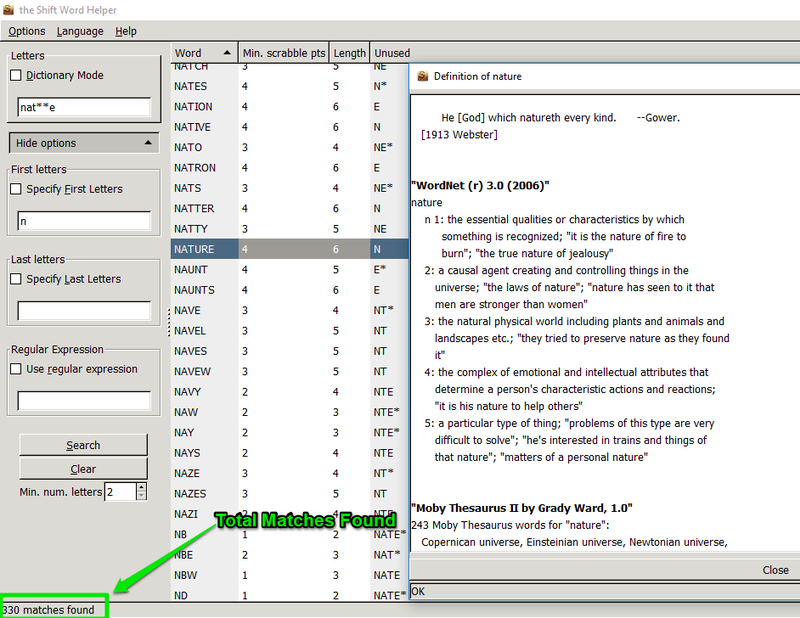 Word Match: It shows word combination(s) exactly matching the entered letters. Scrabble: This mode didn’t work for me. You can also apply filters to your searches. It also shows the total number of words formed. So, there is no need to count them. Like Words With Hints, it also displays the meaning of each word. Just click a word and it displays its meaning on your computer’s screen. In addition, it also shows the possible Anagrams of that word and its Wikipedia page (if it exists). It also lets you add a new word and edit a pre-existing word to its dictionary. Besides this, you can also delete a word from this dictionary. 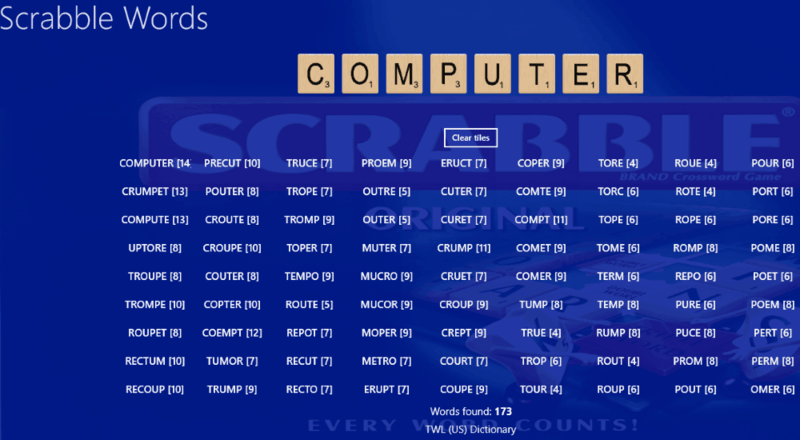 Scrabbler is another Scrabble Dictionary in this list of free Scrabble Scrabble Dictionary software for PC. Like Words With Hints, this Windows 10 app also offers very simple interface. Just enter a string of English alphabets and get results. It shows all possible word combinations that can be formed from alphabets defined by you. You can neither view meaning of words here, nor can edit or add more words to its Scrabble dictionary. You can also search for words that contain a specific letter or word. For example, if I have to find all the words that contain word Bio, like Biome, Biology, etc. then I would begin my search in “Words Starting With” section by typing the word Bio. It also shows the number of possible words thus formed. Srabbler Aid is another free Scrabble dictionary for Scrabble players. This free Scrabble word finder helps players improve their Scrabble skills. This Scrabble helper software works in two modes. In one mode, it lets you enter a string of letters/alphabets and shows you all possible word combinations for that string. You can enter a string of any length. I entered 16 letters long string and that string was accepted by the software and I got the result for that. In another mode, it provides you a string of letters from which you have to form maximum possible words, just like in Scrabble word game. As this is not a Scrabble word game, you can take unlimited hints to form words from the given string of letters. Its built-in dictionary has more than 50000 words of 2 to 7 letters. You can add or delete words in its Scrabble dictionary in Word Maintenance menu. If you find any difficulty using this freeware, you can click Print help option in File menu. This will open help file in PDF format in your browser, where you can read it or take a print out. Scrabble Words uses two Scrabble dictionaries and gives you result according to the type of dictionary selected. These two dictionaries are SOWPODS dictionary and TWL(US) dictionary. This is a very simple Windows 10 app to find words. No clicks are required to operate this app. Just launch it and start typing. Press spacebar key on your keyboard to add a blank space and use question mark (?) to get only matching words. For example, if I type LI?T, then the possible word combinations will be LIST, LINT, LILT, and LIFT. But if I use space in place of question mark, the results displayed will be all the possible combinations of the letters entered and I will get more results as compared to the previous one. Although Scrabble Words is a great word finder from letters that helps you know new words and improve Scrabble skills, it has some limitations. You cannot type a string containing more than 9 letters and also, it does not display meaning of any word. 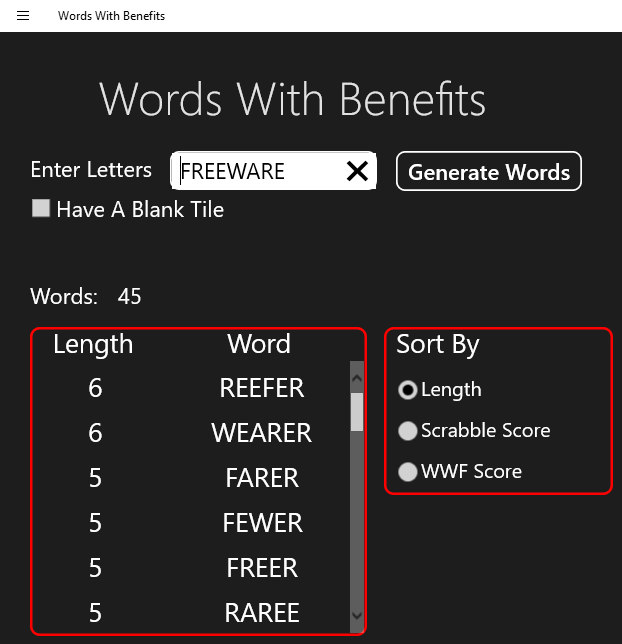 Download Words With Benefits, an easy to use Scrabble dictionary freeware for Windows. This Scrabble word finder is a Windows 10 app that helps you improve your Scrabble skills and also improves your vocabulary. Words With Benefits is very simple to use. What you have to do is just click in the search tab provided in the app, type any jumbled letters and hit enter or click Generate Words button. Use space for putting a blank within your letters. It will show you the maximum valid word combinations. 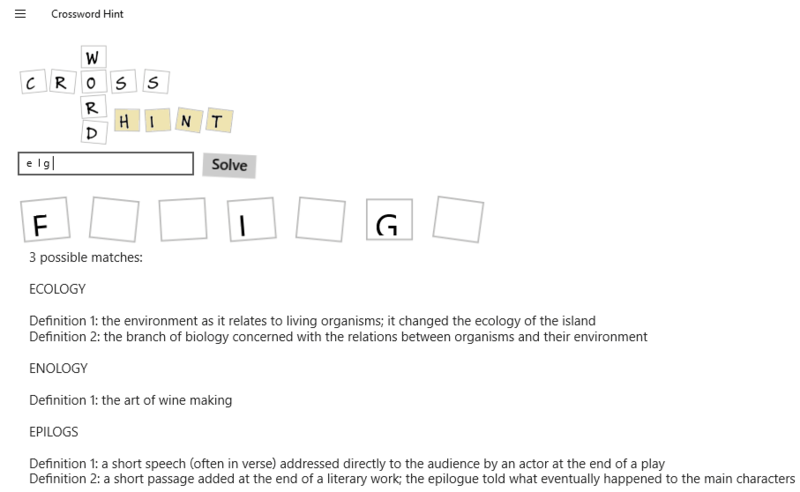 The number of words generated from the entered letters is also displayed on the screen. You can sort the result in decreasing order of Length, Scrabble Score, etc. World of Words, free word finder Scrabble helper comes with three options to find words. This makes searching for words a little bit easy. As you launch this free Windows 10 app, you will find three categories for finding Scrabble words, namely, Anagrams, Crossword Helper, and Prefixes and Suffixes. Anagrams: Enter a text and get all valid Anagrams for your entered text. Inserting a question mark will give more Anagrams. For example, I will get more Anagrams if I type D?G instead of DOG. Prefixes and Suffixes: This is an amazing word finding mode of this words finder app. 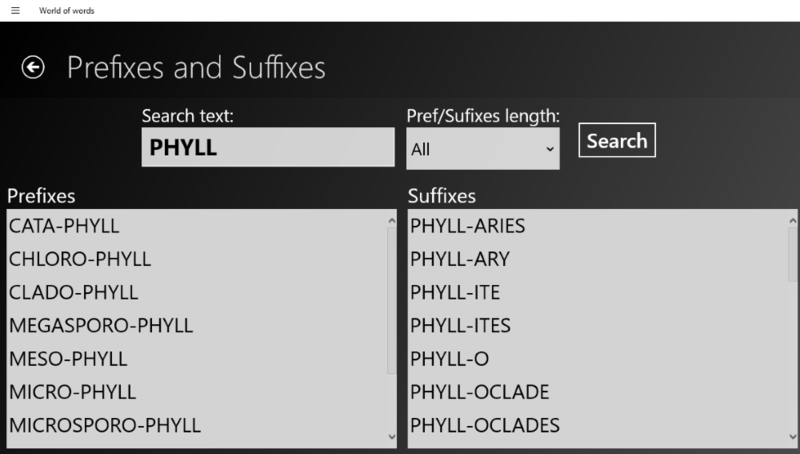 Enter a word and select length of Prefix/Suffix, and it will generate all possible words by adding that word as prefix and suffix. Crossword Helper is dedicated to Crossword game. So, if you play Crossword game, then this feature might come in handy. It supports 6 languages: English, Polish, Dutch, Spanish, French, and Italian. Out of these 6 languages, only English is available as a default language and rest of the languages can be downloaded free of cost. Cross Word Hint is a free Crossword Puzzle solver. Though this Windows 10 app doesn’t have many features like other Scrabble dictionary software in this list, it is a good Scrabble word finder app. You just have to type a text in the search bar of this app and hit Solve button or simply press enter key on your keyboard. It will then show you all the possible matches respective to string of letters that you have entered. To get more specific results, you can use space in between letters. Displays definitions of most of the words. No internet connection is required. Forms very less/sometimes no matches to randomly entered letters. Download Word Study, a Scrabble helper that contains more than 170,000 English words. Using this Scrabble dictionary, you can easily find out words containing particular letters entered by you. You can enter up to 12 English alphabets to search for words. It also lets you find words starting and ending with particular letters. Before using this software, you should have the knowledge of each tool provided in this freeware. NOT: As the name implies, this feature can be used for excluding particular letter(s) from your search. Position Lock: If you want to find words containing specific letter(s) at certain fixed positions, you may check position lock boxes at respective positions. Relative lock: Use this feature if you want to find a word in which a letter is followed immediately by another letter. Besides these features, you can also apply some filters to your searches, like find words of specified length, include words shorter or longer than the specified length, etc. It also shows you the total number of possible word combinations. This is a very good word finder Scrabble software, but it can be a little bit time consuming for first time users.